Drew Scites made 40 saves and Great Falls scored the game’s first five goals Friday night while handing the Helena Bighorns their first North American 3 Hockey League loss, 8-3. Helena had started 12-0 and had the last remaining perfect record in the NA3HL. Lindros Beard scored twice for the Americans. NOT PERFECT: Wisconsinite Cole Caufield had a hat trick while Trevor Zegras posted a goal and three assists Saturday when USA Hockey’s National Team Development Program handed the Muskegon Lumberjacks their first United States Hockey League loss, 8-3. Muskegon, which still leads the Eastern Conference, opened the season with eight straight victories and was the last remaining unbeaten team in the USHL. Spencer Knight saved 30 shots for the NTDP. Earlier this fall, he backstopped Team Jamie Langenbrunner at USA Hockey’s All-American Prospects Game in St. Paul, Minnesota. Zegras went on to score another goal and add two more assists Sunday in another 8-3 victory, this time over the Dubuque Fighting Saints. TWO OF THREE: Former U.S. Under-18 Men’s Select Team netminder Isaiah Saville from the Tri-City Storm earned his second USHL Goaltender of the Week award in three weeks. Saville stopped 25 shots in Saturday’s 2-1 shootout win over the host Lincoln Stars. The University of Nebraska-Omaha commit from Anchorage, Alaska, improved to 5-1-1 with a 1.54 goals against average and .941 save percentage. Saville has helped make Tri-City the only USHL team averaging fewer than two goals allowed per game. LEAGUE LEADERS: The Austin Bruins won three times and have the North American Hockey League’s best record at 10-1-0-3. The Central Division leaders have won four straight and are 7-0-0-2 since suffering their only regulation loss. Veteran forward Dante Zapata, a 20-year-old from Huntington Beach, California, scored in all three wins. Zapata scored a goal and assisted on the other two in Wednesday’s 3-1 win over the Minnesota Wilderness. The third-year NAHL player had an assist in a 5-4 Friday road win over the Chippewa Steel, then added two assists in Saturday’s 5-0 home win over the Steel. The Midwest Division-leading Minnesota Magicians also won three straight and are tied for the league’s second-best record at 12-4-0-0. Defenseman Andrew Kruse registered a goal and three assists and was plus-9 during the three wins. NA3HL STREAKS: The Binghamton Junior Senators posted their 10th straight North American 3 Hockey League win Sunday while the Northeast Generals were winning their eighth straight. Binghamton shook off two Dylan Saccone goals to beat Skylands, 4-2, while outshooting the Kings, 42-19. Tami Merilainen had a hat trick and Marc Faia scored twice for the Generals in a 9-3 romp over the Maine Wild. 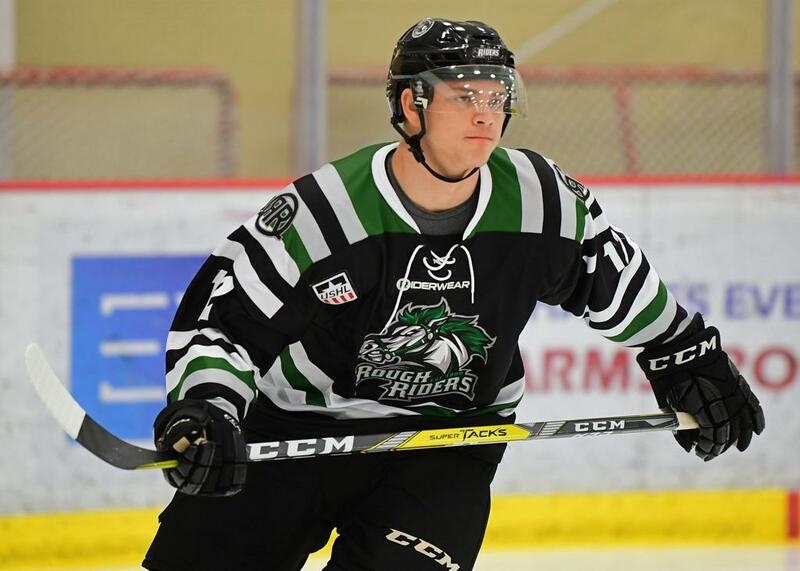 ONE-TIMERS: Minnesotan Luke Johnson from the Sioux Falls Musketeers leads all USHL defensemen in scoring after getting points in all three weekend games, totaling a goal and five assists … Yellowstone Quake team captain Luke Hartge scored all seven of his team’s goals in an 8-7 loss to the Butte Cobras … Jon Murphy had two of the game-winning goals as the Seahawks Hockey Club won three straight in the Eastern Hockey League … Goalie Billy Girard is 3-0-1 with a 1.48 GAA and .957 save percentage to help the Boston Junior Rangers go 8-0-1 in October.